JT Studio’s surprise release at Taipei Toy Festival 2018 has now been confirmed for an online release! YORU x YORU has been transformed from 1/6th scale high-end action figure into a full soft vinyl version. 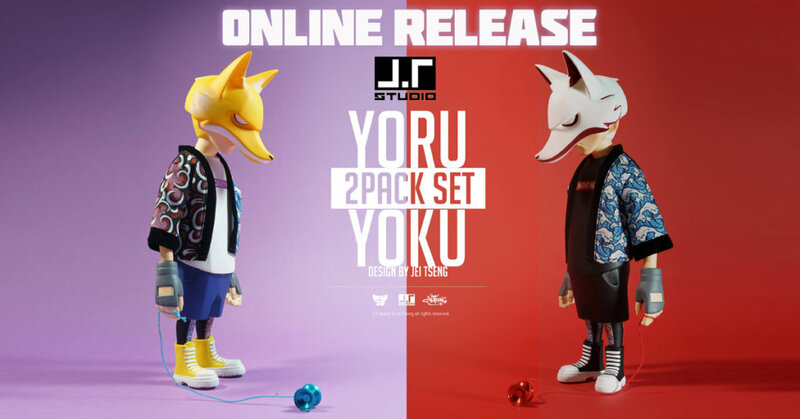 JT Studio’s “Street Mask” series heads to the vinyl direction and we have to say it’s not been toned down too much as both YORU x YORU vinyl edition has clothing and accessories to go with them both. YORU twin brother, since they were kids YOKU like doing the same thing as his older brother. Ever since YORU started yoyo, YOKU began learning along with YORU, but his skill was never a matched of and always below his brother, to a point where everyone thought YOKU was just a second-rate YORU, which causes YOKU to grew envy and hatred, that made “Night M.” to bring him into their clan. Price: $120 USD Each OR 2PACK Price: US$230, Pre-order Price: US$190 a HUGE saving of $100 USD for pre-ordering the 2pack.